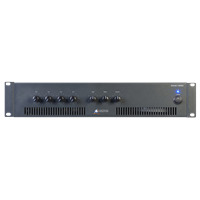 Australian Monitor AMC+250 250w 100v Mixer Amp. The Australian Monitor AMC+250 takes the rugged reliability of the famous AMIS range and delivers the same high quality audio reinforcement, in a low cost, 2 rack unit package. The AMC+250 has 4 XLR microphone and dual RCA line inputs with input 1 having priority over inputs 2-4 (defeat able) and global 12VDC phantom power.